Sometimes we live in our houses and, through living in them, know how to improve them to suit our needs. Other times, we live in our houses and just keep using our spaces as they are even if they don’t work the best for our needs. I’d been doing the second one of those with my kitchen cabinets. Ever since the kitchen reveal, all of our kitchen supplies (bake and cookware, pantry staples, etc.) have stayed in the same spot. 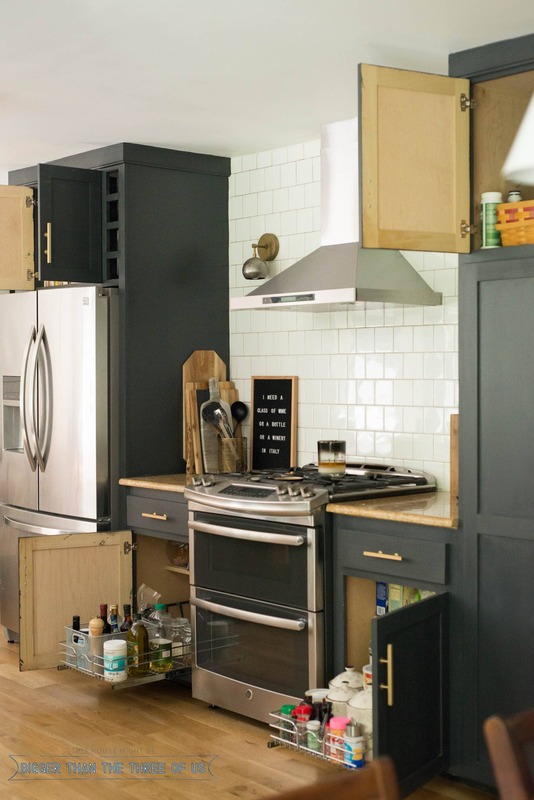 Somewhere in the back of my head, I knew that the kitchen wasn’t organized or utilized as best as it could be but I wasn’t sure what to do about it. Well, a few weeks ago, I spilled some baking products in our bottom kitchen cabinet and just had enough. I reached out on Instagram to ask for organizing advice and, upon getting advice, immediately set out to organize my kitchen cabinets. 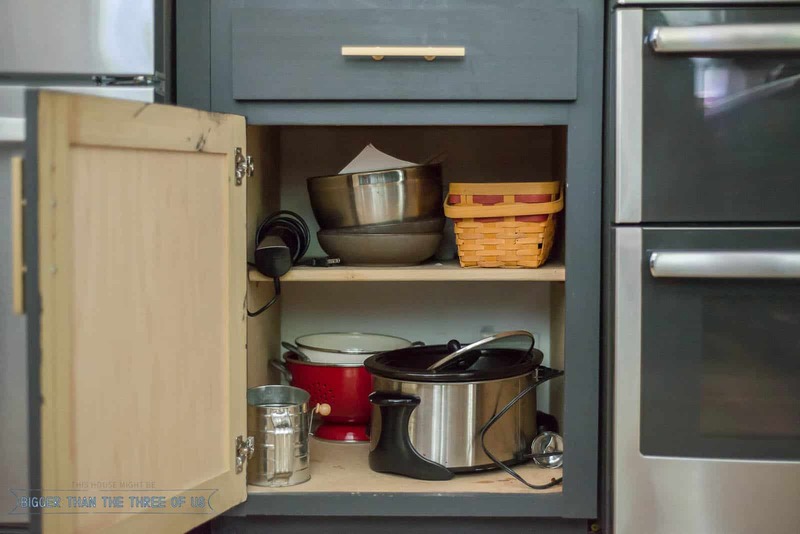 Today, I’m sharing a few Easy Kitchen Organizing Ideas that I’ve implemented and I bet they would make a difference for you as well. I concentrated my efforts on the cabinets that flanked the oven. Organizing the bottom cabinets was a priority. While organizing those (or thinking about organizing them) I ended up organizing above the fridge and above our small pantry. Let me show you some of the before pictures so you have an idea of what I was dealing with. As you can see, the left cabinet wasn’t “stuffed” full or anything BUT we did have to move things around everytime we wanted to get something out or put something in. The right side was “stuffed” full. It was a pain to get any of the baking things out and, to be honest, I spilled something just about every time I took something out or put something back in. Above the pantry was just “hot mess central.” Seriously. Not only did most of the bottles not fit under the second cabinet, but things got pushed back and it’s hard to see when something gets pushed back. The upper cabinet is a decent size but we’ve never utilized it well. We had similar problems above the fridge. I actually get in and out of this cabinet everyday because I make smoothies. It’s an annoying cabinet to get the blender in and out of because I have to reach up and over the fridge. 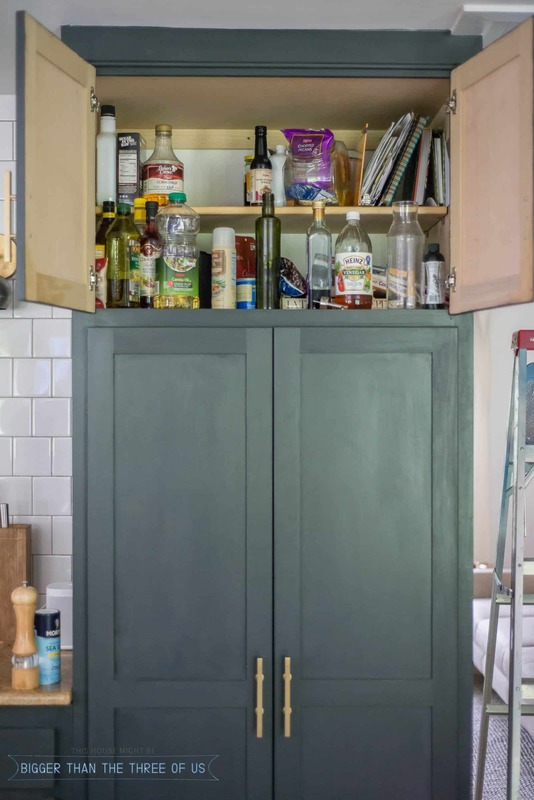 This cabinet also has tons of space but, yet again, was not being used well. So, like I mentioned earlier, I reached out on Instagram for organizing advice and got quite a bit of feedback. I’ve linked the recommended products below and I’ve added them to a kitchen organizing list in my Amazon shop. 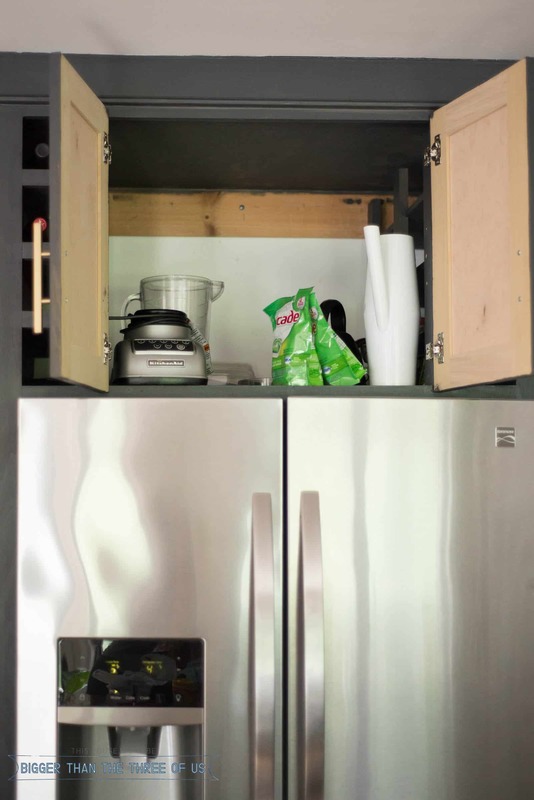 Look at the cabinets that you are using. Are they working well for you? 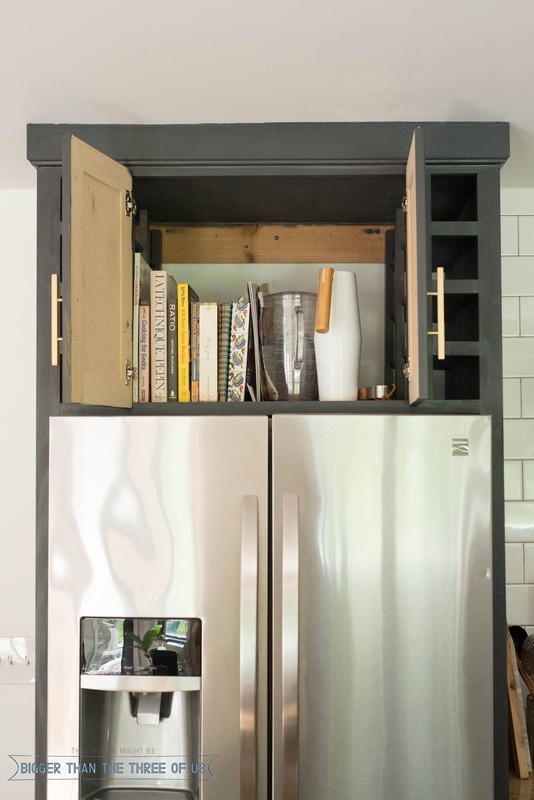 If not, don’t be stuck using the same cabinet for the same purpose you’ve been using it for. Change things up! 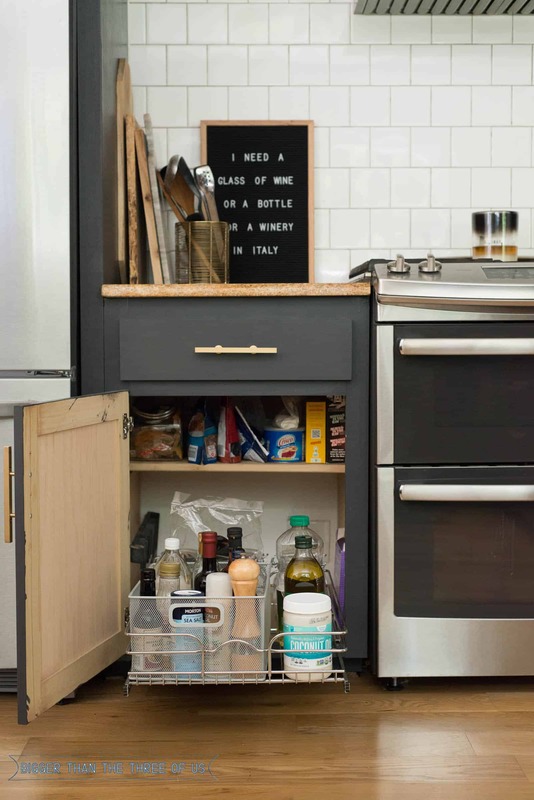 For organizing deep kitchen cabinets, you really need to be able to have easy access to everything. 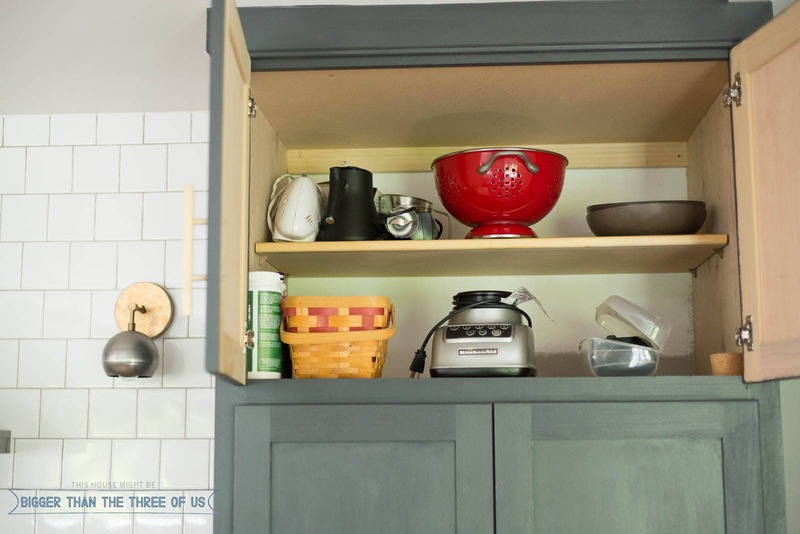 You can do this easily by installing pull-out shelves. 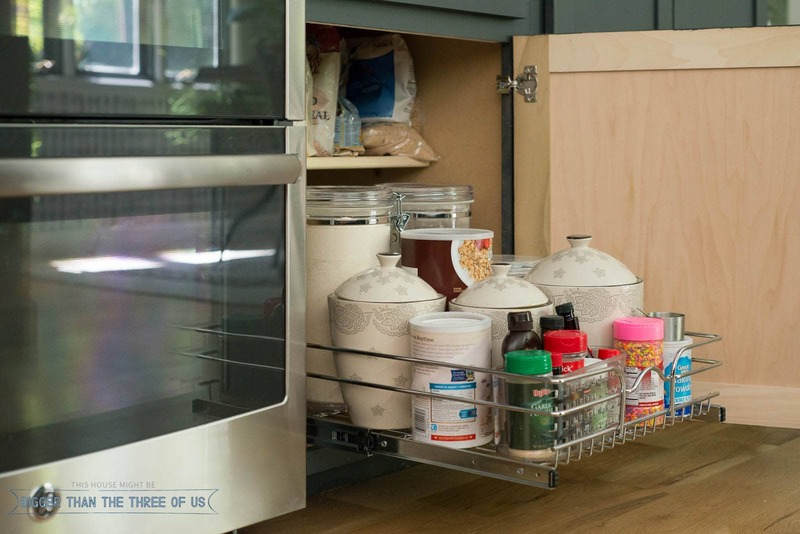 Utilize baskets to contain oils, spices, flour, etc. Glass jars with labeling is going to be your best friend! 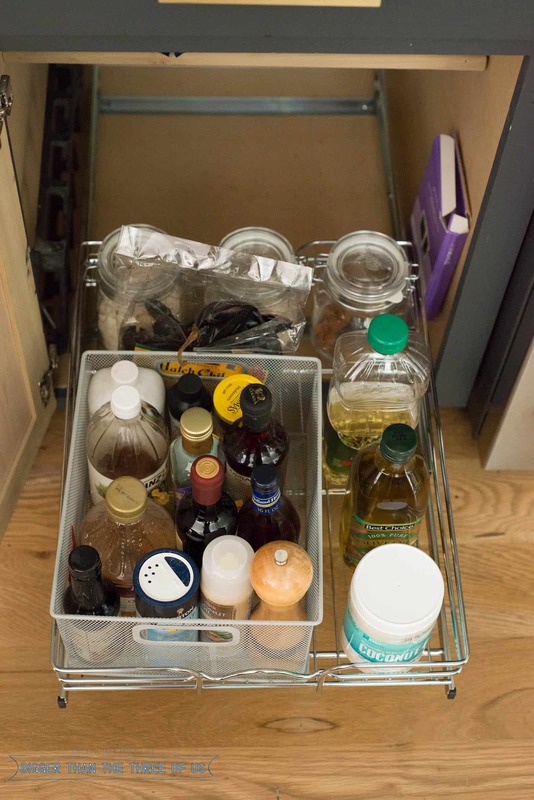 Use a lazy susan for your oil and condiments. It even works great for canned goods too. I took that advice and implemented #1-#3. I really took a look at how and where we were storing things and made really good changes that made more sense. I also picked up two pull out cabinet shelves and had them installed in about ten minutes! I didn’t think they would make a huge difference but, oh boy, was I wrong. Seriously, they are amazing. And lastly, I used two baskets on the pull-out shelves to contain the things that needed some extra help. With this closeup shot, you can tell we need to do a bit of a paint touch-up. I hadn’t realized that before I was down on eye level with this cabinet. oops! So, as you can see, everything to the right of the oven stayed in the same spot. 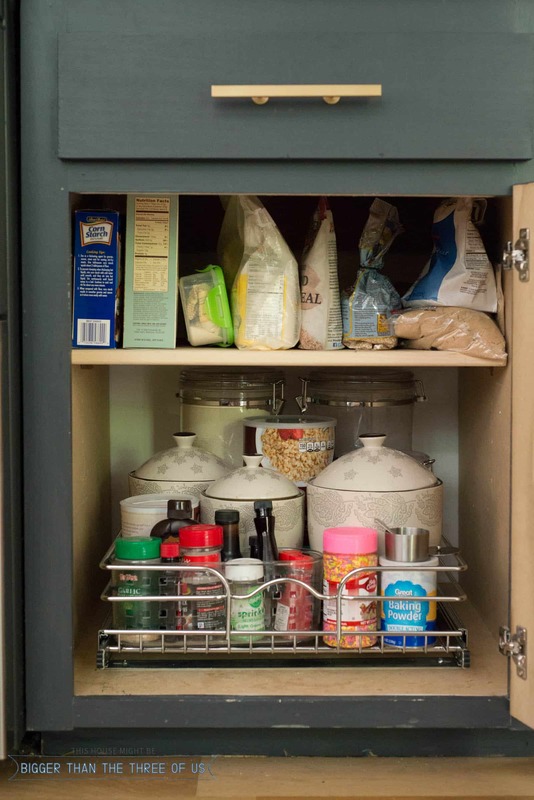 We gained valuable organization with the pull out cabinet drawer and a clear organizer to keep the extra spices and sprinkles contained. The organizer is one that we used to use in the bathtub when Greyson had lots of bath toys. It’s always nice to shop your house to see what you could use before buying something. The oils and extra baking stuff used to be above the pantry but things tipped over or got lost up there. I decided to take the advice of others and really think about what made the most sense for each of the cabinet areas. It made the most sense to install another pull-out drawer and then corral all the smaller bottles within a basket. The basket is another one that we had laying around. 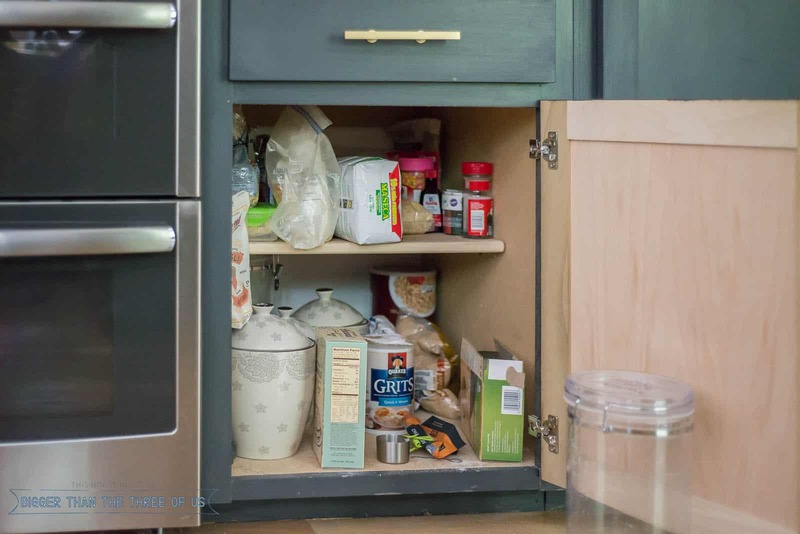 My friend, Joanna at Jojotastic, recently shared a round-up of functional dry goods storage containers. I’m going to stick with what I have right now, but if I end up needing more storage, I’ll definitely buy a few of the one’s that she linked. I don’t know why I hadn’t thought of this before, but it definitely made the most sense to move some of our kitchen tools (colanders, mandolin, immersion blender, kettle, etc.) above the pantry. Not only are these things not used daily (except the blender) but they can easily be seen, even above my head. Above the fridge (the hardest spot to reach in our kitchen), I moved some of our cookbooks, extra pitchers and grill utensils. So, that’s it! I spent about $75 on two pull-out cabinet shelves and about two hours reorganizing, cleaning and getting my kitchen back together. Seriously, it was a Saturday afternoon well spent. The kitchen has been organized like this for about two weeks and we are just loving it! Seriously, I’m scratching my head as to why it’s taken me this long to think about making changes to this space! Like I mentioned earlier, I wanted to do a round-up of the things that I bought but also the pieces that were recommended to me! p.s. 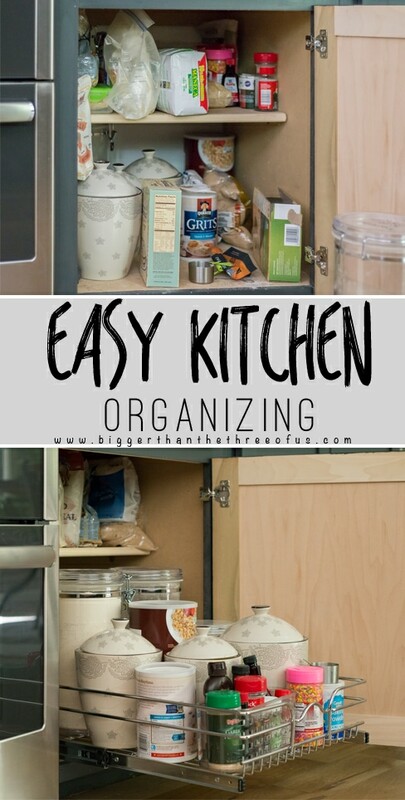 If you liked this post on Easy Kitchen Organizing, then you should definitely check out my pantry organization post!